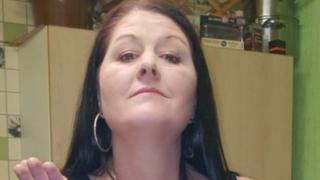 Image caption Debbie Twist's children said she was their "best friend" and would be "missed by everyone"
A mother-of-three who was found stabbed to death at a house in Greater Manchester was a "much-loved friend to many", her family have said. Debbie Twist, 47, was found dead in Leigh on Sunday. A 39-year-old man arrested on suspicion of murder has since been bailed. Ms Twist's children said in a joint statement: "Debbie wasn't just a Mum. She was our best friend and a friend to many. She was the best nanna and mother-in-law, and much-loved sister." They added: "She was taken from us too soon and under tragic circumstances. She will be missed by everyone." A 25-year-old man who was taken to hospital with arm injuries following the incident has since been discharged. Greater Manchester Police said the attack was being treated as an "isolated" incident. A woman, 37, who was arrested on suspicion of assisting an offender has been released pending further inquiries.